Blackjack is one of the most exciting casino games and as such, it is no surprise that a number of casinos offer blackjack tournaments in order to give players the chance to improve their gaming experience even more. Such special events are the perfect opportunity for gamblers who want to put their skills to the test and compete against other participants and the dealer. This is exactly one of the reasons why blackjack tournaments gained in popularity so much over the past few years. 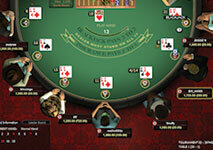 Nowadays, players can take part in such special events in a number of land-based casinos as well as online. Blackjack tournaments have proven to be very entertaining as players have the opportunity to win prizes that are worthwhile. In general, in blackjack tournaments players compete against each other which is one of the biggest differences when compared to the classic game. While it is true that every player indeed wins or loses against the dealer, their ultimate aim is to get as much chips as possible. The reason why is that the player who has collected the highest amount of chips gets to be the winner. It is worth mentioning that blackjack tournaments just like many other casino tournaments have an entry fee. In return players get chips which are also called starting stack. They can be used only in this game and they don’t have any real value. Every tournament has several rounds of play in which players join different tables and the participant who cannot meet the requirements to take part in the next round is eliminated. At the beginning of every round everyone is given the same amount of chips for an equal start. All of the chips that players win during the game are usually displayed on a leader board so that they can determine their position. Depending on the tournament, one round can continue until a certain period of time is reached or until a determined number of hands are played. The game is played in the same way as the classic blackjack, meaning that in order to be able to win, players need to apply a strategy. Most blackjack tournaments are available for all types of players, whereas others are private and they can be entered by invitation only. The size of the prize in blackjack tournaments varies, depending on the entry fee and the event type. Blackjack tournaments fall into different categories, depending on the number of rounds they consist of and the way they are conducted. It is possible to compete only against players on a particular table or against all of the participants in the tournament, regardless of the table they are at. Due to this huge diversity, players of all types have the chance to play in such events and enjoy blackjack in a very exciting way. Moreover, it is also possible to take part in online blackjack tournaments as a number of online casinos offer them. It has never been so accessible to compete against other players and get an extremely thrilling experience from doing so. Perhaps, the most famous tournaments, offered by many casinos, are the so-called Elimination tournaments. As the name hints, in these events a certain number of players are eliminated after each round. The exact rules differ from one casino to another, but in most cases, the player who has collected the least amount of chips has to leave the game. In these tournaments gamblers compete only against the rest of the participants on the respective table. Another very popular type is the Non-Elimination tournaments which usually feature only one round. In them, the winner is the player who has managed to get the most chips at the end of the game, however besides the first place, there are also other winning positions, depending on the amount of collected chips. It is worth noting that if players lose all of their chips during this round, they are automatically excluded from the game. Players also have the chance to try to win Sit and Go or Scheduled tournaments. The main difference between these two events is in the way they start. In Sit and Go tournaments it is possible to join a table whenever as their starting time is not fixed in advance, whereas Scheduled tournaments can be entered only at the appointed time and they require a registration beforehand. Players can play in Mini tournaments which are usually conducted during the weekends and have affordable entry fee. Another popular type is the Freerolls tournaments which don’t require any fee in order to be entered. Usually, the reason why they are held is to attract new players or serve as a reward for regular ones. However, since they don’t have an entry fee, their prize is lower in comparison to the rest of the tournaments. Nowadays, a number of casinos offer blackjack tournaments thanks to which players have the chance to enhance their gaming experience. When playing in blackjack tournaments there is a possibility to compete against less skilled and inexperienced players and thus, proficient gamblers who have a reliable strategy stand a very good chance of winning. These special events have proven to be a great source of entertainment which attracts hundreds of players, regardless of their experience and gaming style. Usually, blackjack tournaments are available for only a certain period of time and they are not regular events which is the reason why players should check the website of the respective casino for the latest information. Let’s have a look at three of the most popular casinos that offer such tournaments. This is the perfect opportunity for gamblers who want to put their skills and strategy to the test and get the most out of every hand. Players of all types have the chance to play in such challenging events and enjoy their favorite casino game in a completely different way. Before playing, it is possible to see the type of the tournament, its prize pool and the number of winning positions. This means that it is not necessary to get the first place in order to receive a prize which is one of the things that makes these tournaments even more enticing. William Hill is a reputable casino that occasionally gives its players the chance to take part in exciting blackjack tournaments. It offers generous prizes and the entry fee is extremely affordable. These special events feature exclusive blackjack tables which also offer extra payouts for particular combinations such as a hand that consists of three 7’s. Thanks to this casino, it is possible to compete against other players and enjoy this game like never before. The gaming process is conducted by professional dealers who contribute to the pleasant experience players are able to get from participating in such events. InterCasino is another well-established casino that has blackjack tournaments from time to time. All that players have to do in order to join them is to pay a small entry fee and get familiar with the time the tournament begins. It is also recommended to have a look at the time the event is scheduled to end as this way players can get a general idea of the type of tournament. Prior to entering players should get fully acquainted with the terms and conditions that apply. The goal of the players is to collect as much chips as possible in order to become winners. At the beginning of the game, all of the participants receive equal amount of chips that depends on the particular event. 32Red is a popular casino that holds exclusive events for blackjack enthusiasts. 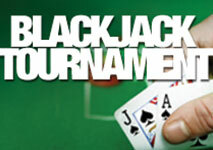 It offers three types of blackjack tournaments in order to manage to fulfil its players’ wishes. This way, gamblers can not only choose the event that suits their bankroll and needs best but also get a very different gaming experience. It is possible to participate in Freeroll, Survivor and $500 Blackjack Attack tournaments and compete against other players. To sum up, blackjack tournaments are undoubtedly very entertaining and challenging for both beginners as well as more seasoned players. One of the best things when participating in such events is the fact that it is possible to play against other participants as well as the dealer and win great prizes. Moreover, the huge diversity of tournaments offers different betting limits and affordable entry fees. It is a good idea to review the rules of the particular tournament before signing up in order to be familiar with its terms and conditions.